Prepare yourself for some deep, deep nerdery. Bombardier would have graduated at the top of his class in Electrical & Electronic Engineering at the Imperial College, London, had he not obliterated half of the William Penny Laboratory in an after-hours project. His reputation led to an appointment for Defence Science & Technology at Porton Down, where he excelled in the weapons program and started creating robotic drones. Following capture by the Red Shadows in a raid, he was forced to work for The Black Major after witnessing all but one of his family members tortured and executed. A later Special Action Force (SAF) rescue operation tragically revealed the last family member was in fact a sleeper agent that still remains at large. Bombardier was then recruited into the Special Weapons Force, which develops much of the equipment used in SAF operations. We've already discussed the history and creation of Action Force, but that's not the end of the story. According to the dedicated fansite Blood for the Baron, after releasing a bunch of generic soldiers in 1982, Palitoy decided in 1983 to create a specific story and characters. As part of that initiative, they created four branches of the team: Z Force, the infantry backbone of Action Force, well supported by heavy armor and artillery; the SAS Force, the behind-the-lines team, skilled in sabotage and disruption; Q Force, made up of underwater specialists; and Space Force, Action Force's eyes and ears above the Earth's atmosphere. But unbeknownst to anyone outside the company until 2008, there were also plans for a fifth team, the Special Weapons Force. Meanwhile, in 1999, a strange prototype figure was found in Florida. The Whiz Bang Toy Store was run by Mike Herz, a man with contacts among previous Hasbro employees. 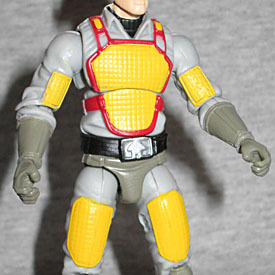 His best guess was that the figure, a grey and yellow version of Flash, had come from the personal collection of Kirk Bozigian, but he knew nothing else. There were several fan theories about what this figure was, but no concrete evidence. 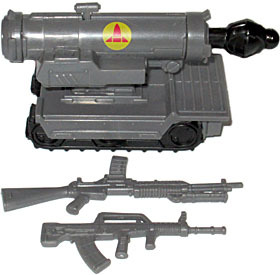 Finally, a decade later and an ocean away, a nearly identical figure showed up in the Palitoy archives alongside the other Special Weapons Force prototypes, with a card identifying him by name (Bombardier) and revealing that he would have come with a repaint of the 1982 Mobile Missile System. And thus was the mystery of the "Gray Flash" solved! The two men who worked together to assemble all the clues were Ron Conner and David Tree; and in their honor, Bombardier's real name (given here for the first time ever) is Conner D. Tree. If the filecard's story about his family and a sleeper agent is a reference to anything, we don't know what it is - so I guess the mystery continues! This figure is, top to bottom, a repaint of the Generation 3 Flash - a figure we never reviewed. Lucky for us, he's also a repaint of Grand Slam, because both of those figures used the same mold. 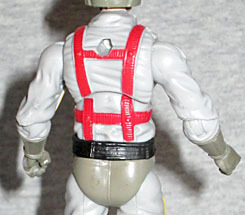 It's a very distinctive body, with padded armor on the chest, biceps and thighs, a belt that has the old Hasbro logo on the buckle, and pantlegs that are loose but have stirrup straps running under his shoes. The detail on his thigh-pads is not as crisp as the rest of the body armor, almost like the molds were wearing out. Action Force's subteams each had their distinctive colors - Space Force was grey, blue and a mustardy yellow, SAS Force was black and grey, Q Force was yellow and blue, and Z Force was green, black and red. Apparently the Special Weapons Force would have been a pale gray (nearly white), with yellow, red, and darker grey accents. While Bombardier is darker than the prototypes, you can still tell what they were going for. The fact that his helmet's visor is translucent blue is a new touch, but it fits with the overall aesthetic. The original figure would have come with the same accessories as Flash, but this one does something better. Suiting his role as an experimental weapons specialist, he comes with a QBZ-97 assault rifle (the export version of the Chinese QBZ-95), a gun that has a top-loading magazine like the British Bren gun but otherwise doesn't look very much like it at all, and a large, missile-launching tank drone with the Special Weapons Force logo on the sides. All those accessories originally came with a Rise of Cobra Ripcord, but they're nice to see here. There's a slot on the side of the drone where either of the guns can plug in. 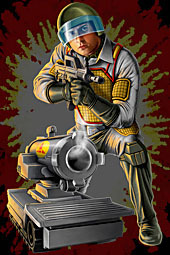 Like Wide Scope and Cesspool, Bombardier's card art was painted by Adam Riches, so it actually looks professional. The art shows Bombardier kneeling next to his drone, the smoke from its barrel suggesting it's just fired its payload. He's got the QBZ-97 tucked into his right arm, aiming it the same direction as the cannon; the toy can't actually duplicate the pose very well, because the original figure came out so early in Generation 3 that the joints didn't have as large a range of motion as they probably should have. There's been some speculation that the character's face in the art may be based on Ron Conner or David Tree - I certainly wondered - but we asked Adam about it, and he said it's based on the toy's actual face. Go figure! I'll say this, though: if the plastic version looked more like the art, it wouldn't be such an ugly toy. Bombardier is an interesting figure more for the history behind the original than for the toy itself. I mean, come on: it's Flash painted grey and yellow. Anybody who really wanted one could buy a loose Flash and paint it like this themselves. That said, it makes a lot more sense to release it here, as part of a fan-oriented exclusive series, than trying to give it a "real" release - the odds are that anyone at all who would care about it even a little is already subscribed. But hey, at least he's not as much of a pitiful vanity project as Sure Fire was.